USC Thornton alumni and students fared well at the 43rd Annual Fischoff National Chamber Music Competition held May 6-8 at the University of Notre Dame. The WindSync wind ensemble, which includes alumni Anni Hochhalter (’09, horn) and Jack Marquardt (’09, clarinet), took the Gold Medal in the Senior Wind Division and will undertake a winner’s tour across the Midwest in the fall. The Callisto Piano Trio were bronze medalists in the Strings Division of the competition. 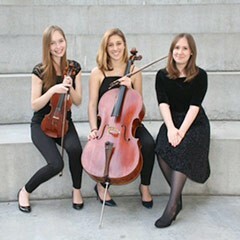 The trio consists of two USC Thornton Trustees Scholars — sophomore piano major Katelyn Vahala and sophomore cellist Annie Jacobs-Perkins — and violinist Geneva Lewis, a high school senior from the Colburn Academy. Coached by Lucinda Carver, vice dean of the Classical Performance & Composition Division at Thornton, and Andrew Cook from the Pasadena Conservatory, they are the youngest ensemble ever to place in the finals of the Senior Division.